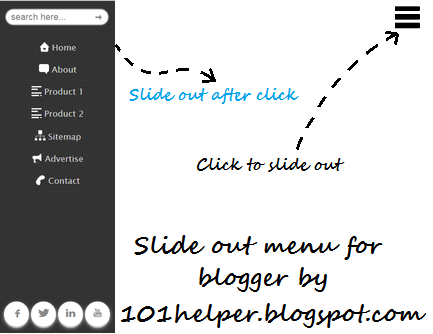 Slide out menu for blogger, blogger slide out menu, wordpress style menu for blogger, blogger menu with icons, blogger menu with social buttons, blogger menu with search box, 101helper blogger menus. Step 1: Go to your blog and click on layout in the menu on left side. Step 5: Replace hashes(#) with your tabs and social networks links. Step 6: Click on save and you are done successfully! Replace hashes(#) with your tabs and social network links. Change code of the color in the highlighted piece of code to change hover color of tabs( background: #67B045;). Replace the text of tabs with your desired text. Hope you like this menu and it is working fine on your blog. Give me your feedback below. Share this post with others and subscribe to get latest news about blogger menus. Keep visiting 101Helper :). Search tags: Slide out menu for blogger, blogger slide out menu, wordpress style menu for blogger, blogger menu with icons, blogger menu with social buttons, blogger menu with search box, 101helper blogger menus. how do i add this to the top? Add CSS code to fix the icon on top. Bro...how to make it stick to top to make it float together without user. You can fix the menu icon on top with css, it acts as a trigger, when hit, menu opens. Can the css be drop here if possible ...? Include this code below <..style> in your menu code. If you want the icon to be fixed on left side change right to left in this code. But what I hate must with this widget is it slide out, it squeeze the entire blog page instead of just overshadowing the page. This is the special thing about this menu.